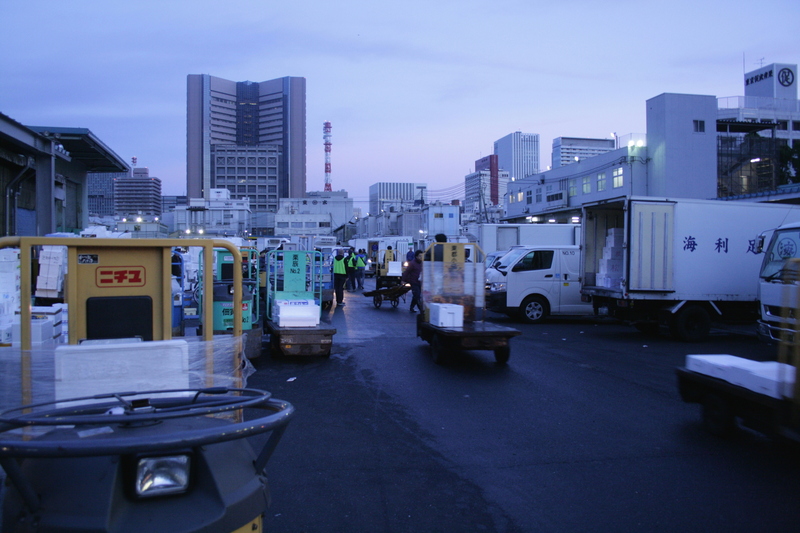 Down on the waterfront far from the heart of Tokyo, the tuna auctions are inaccessible in ways that don’t involve backpacking trips with a repulsive number of Clif bars. 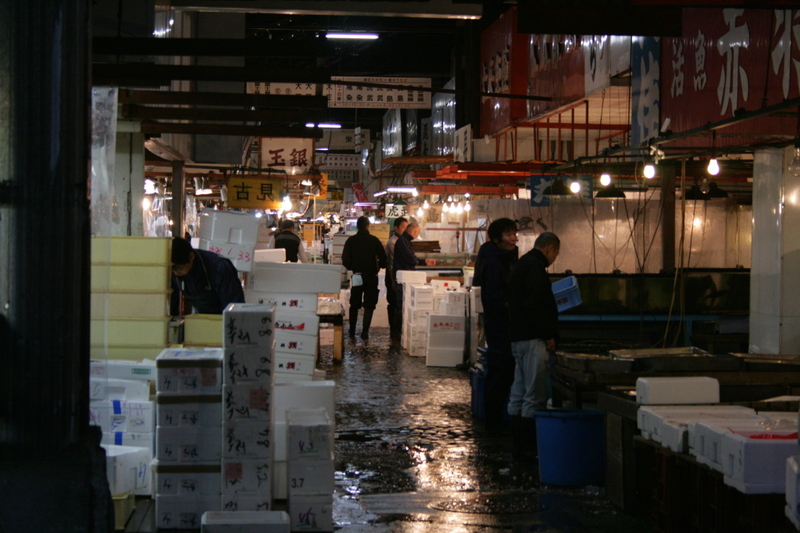 The area is a working market; there are hundreds if not thousands of people processing all manner of sea creatures every day of the week. Only a committed hundred tourists can get in to see the auctions on a given day. The auctions are a small part of the market both physically and economically, so it’s not like everybody and their tourist grandmother can show up and take part. Having thousands of tourists mulling about would be dangerous to say the least. There’s also the fact that, for whatever reason, anything related to fish just doesn’t happen when the sun comes up. I remember my dad taking me fishing, and me being excited about fishing, until I was having to get up at 2am so we could be on the water “when the fish are up”. 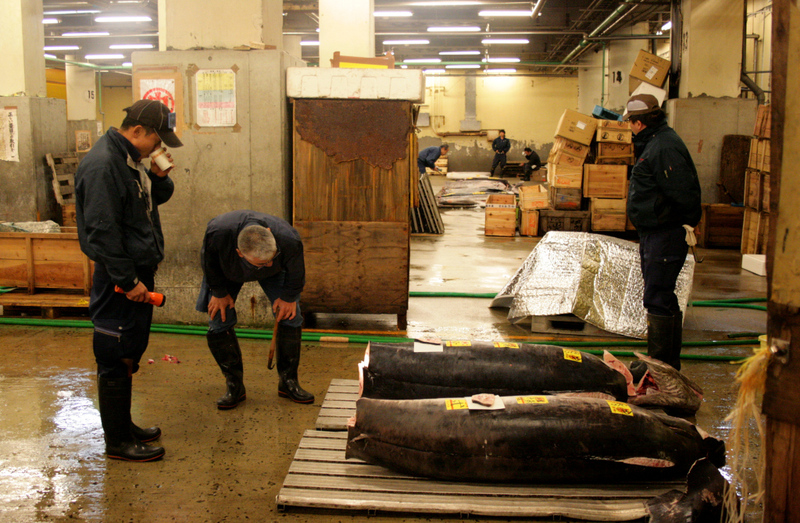 Apparently the practice of buying and selling fish also must happen in the dark. 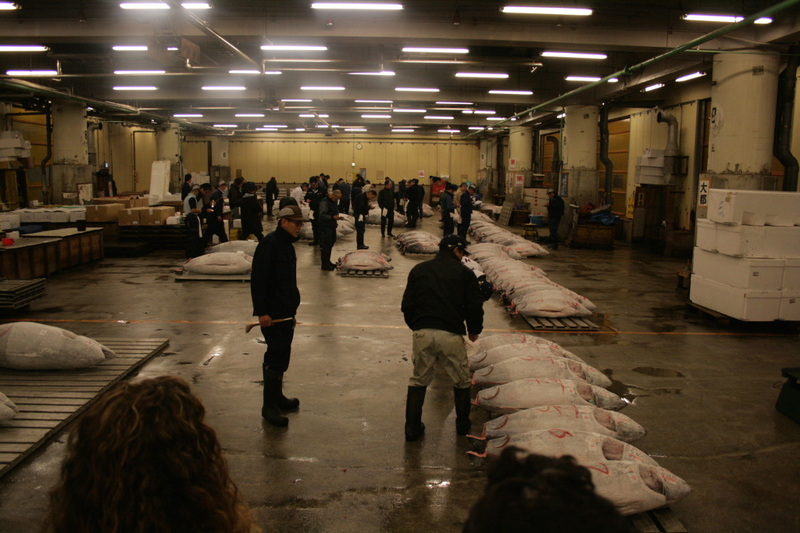 To get into the auction, visitors must appear at the “Fish Information Center” no later than 5am. Arriving earlier is encouraged because it’s first-come-first-served. 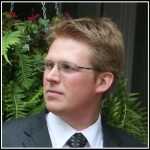 Mike and I left our hotel early – Mom and Tiffany were having no part in getting up this early – and joined a convoy of refrigerated trucks and taxicabs headed down to the waterfront. The rest of Tokyo was definitely still asleep. What few people we saw out at that hour looked like they were ending their night more than starting their day. We arrived a little early, but a line of people had already formed. We found our place at the end of it, and watched as taxi after taxi dropped off their fares. Eventually we were let in to a large (for Japan) waiting room and given a yellow vest and a map. This vest was our “ticket”, so now all we had to do was wait. Leftover styrofoam packaging. There were mountains of this stuff everywhere. Hopefully they recycle. And a long wait it was. The first auction wasn’t until 7:15, so for the next two hours, tourists from every land sat cross-legged on the floor (there were no chairs) waiting like it was the most disappointing ride in Disneyland. Hurried excitement was quickly replaced with the steady drone of snoring sleepers and traveling students. I slumped over my camera bag for an unknown amount of time. When I woke up, it still wasn’t time. By this point I thought I’d made a horrible mistake. Why the heck did I get up this early to sit squished into a room with a bunch of sleepy people. 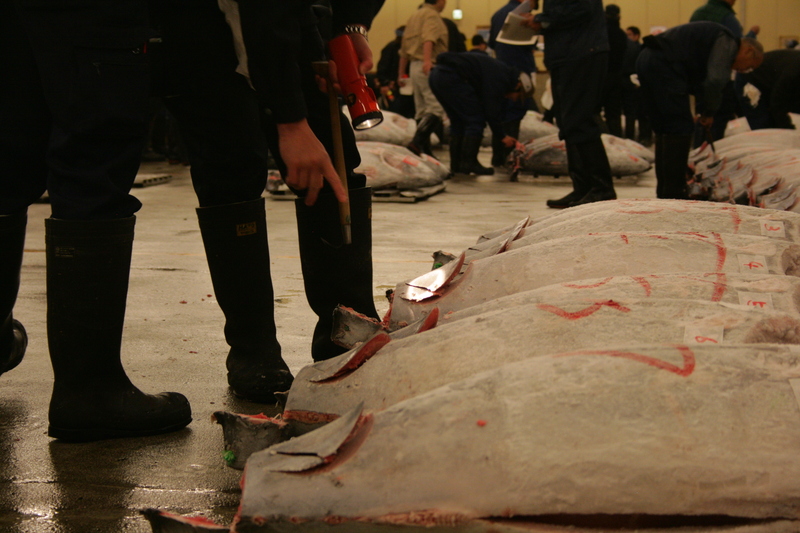 How could a tuna auction even be worth this? I’m going to owe Mike many coffees, followed by many beers after we’re done. After what seemed like many months of sitting on a tile floor with my legs crossed, the first group (ours) was finally let out and ushered into the market. Our legs were about as sleepy as the rest of us, so we staggered through like a bunch of half-coherent zombies, trying to shake off the pins-and-needles feelings in our limbs. The market was much more alive than we were. Electric carts carrying fish of all kinds whooshed past us. 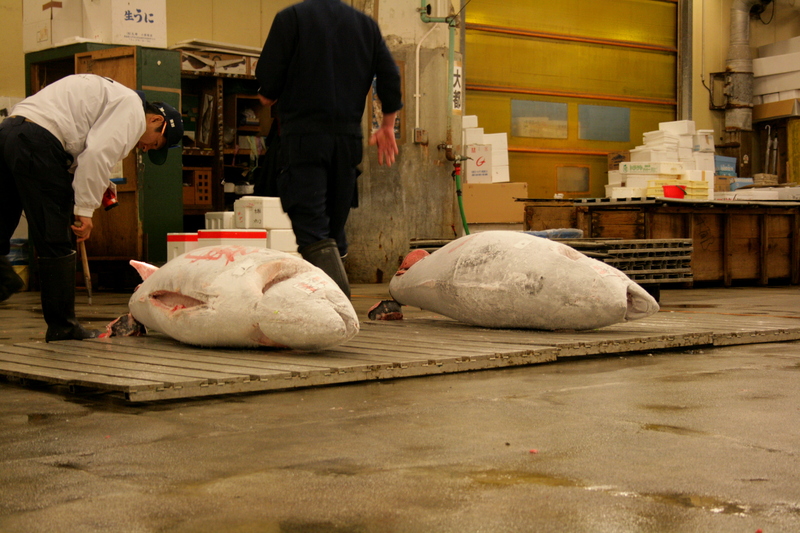 Workers took strange creatures out of their coolers and cut and packaged them in a blur of activity. 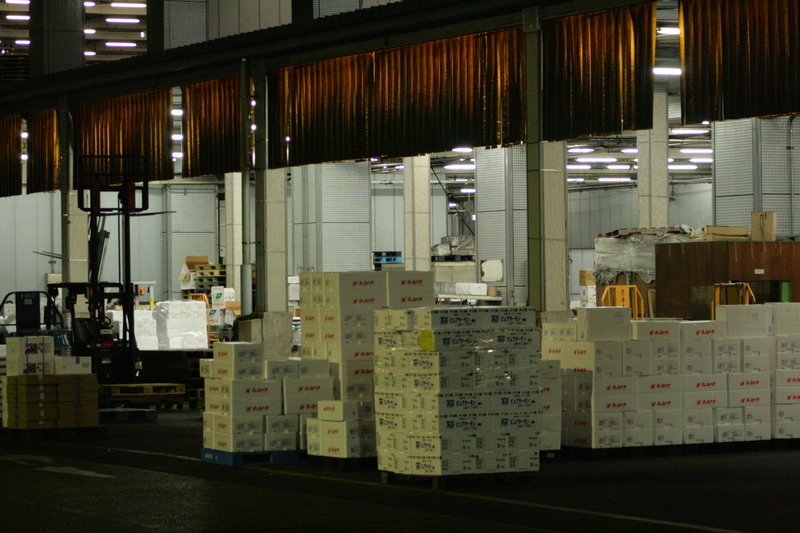 We took a sudden turn through a nondescript door, and then we were in a warehouse full of giant fish popsicles. We only got a small walkway down the middle of the room, cordoned off to protect the bidders from the sleepy mob. Crammed together again, we all elbowed each other frantically to get some photos of the action. 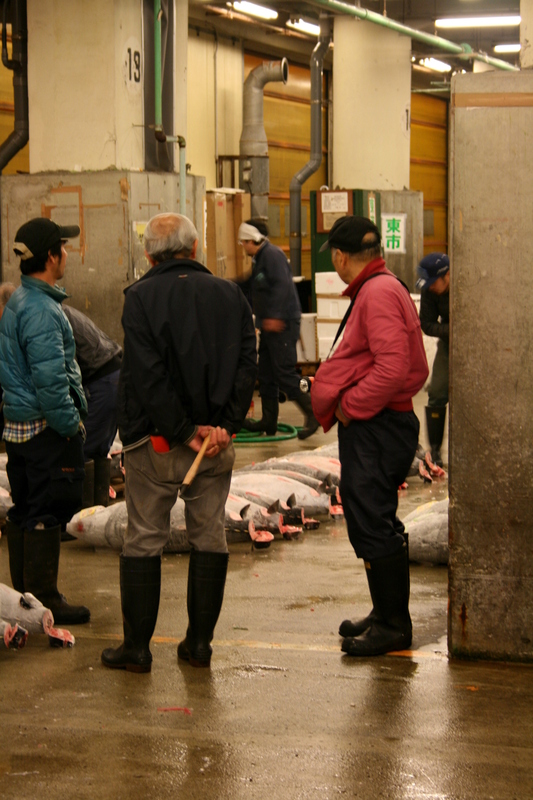 Wherein the noun action refers mostly to a bunch of Japanese men bending over to look at fish. 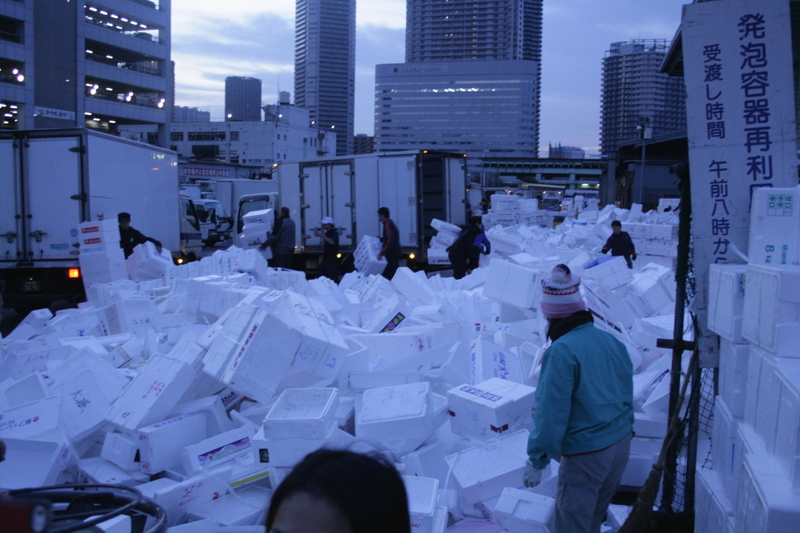 …they have a refrigerated case out front full of the seafood for sale that day. …so you see impeccably dressed and bearded men carefully considering his options before pointing at his chosen fish, basing his decision solely by the appearance of said fish. The Japanese don’t really do it that way. 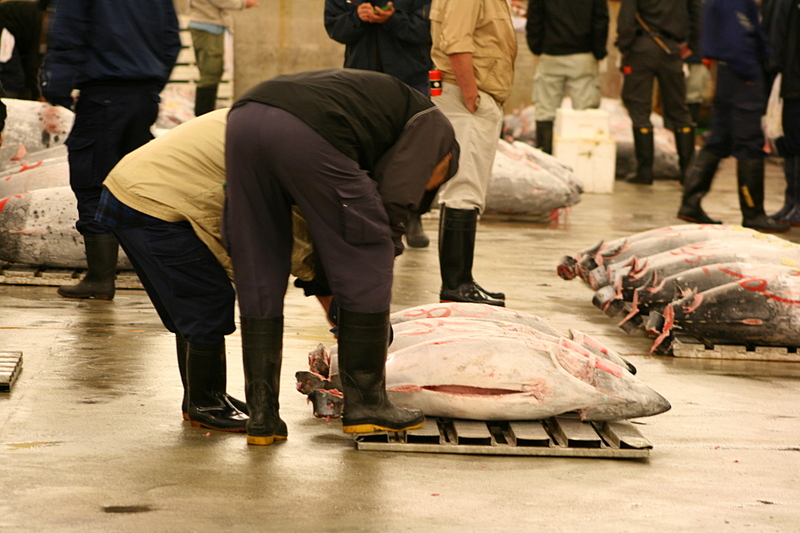 The first thing I noticed was how huge tuna are. I always figured they were small, since tuna cans are small. 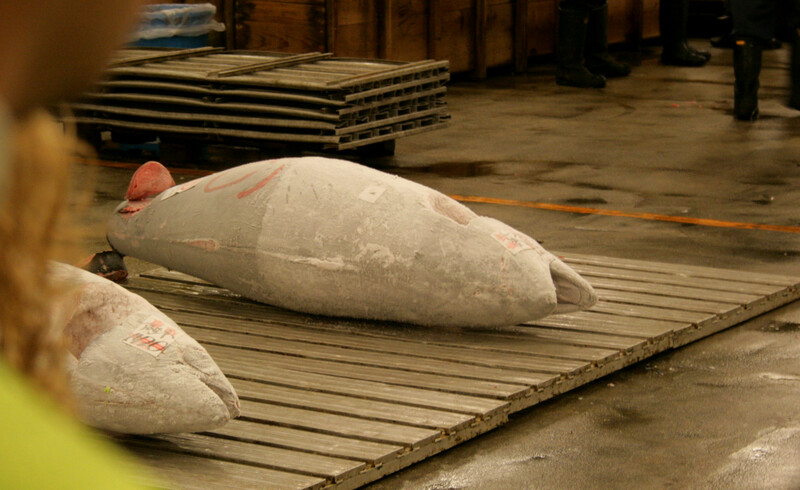 Salmon was the largest fish I’d ever been acquainted with, and they don’t even come in cans. In hindsight, these two may not have been tuna. Not sure what they were. 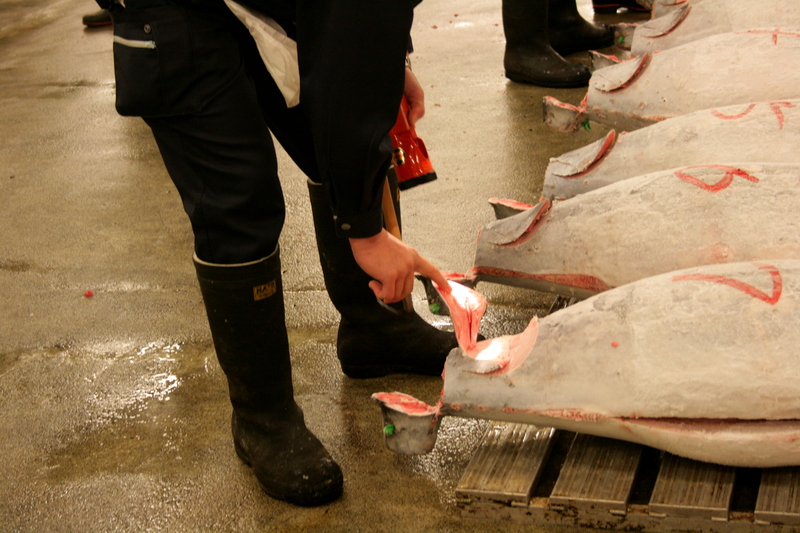 Most of the tuna looked frozen, but all of them had been cleaned of their undesirable parts. 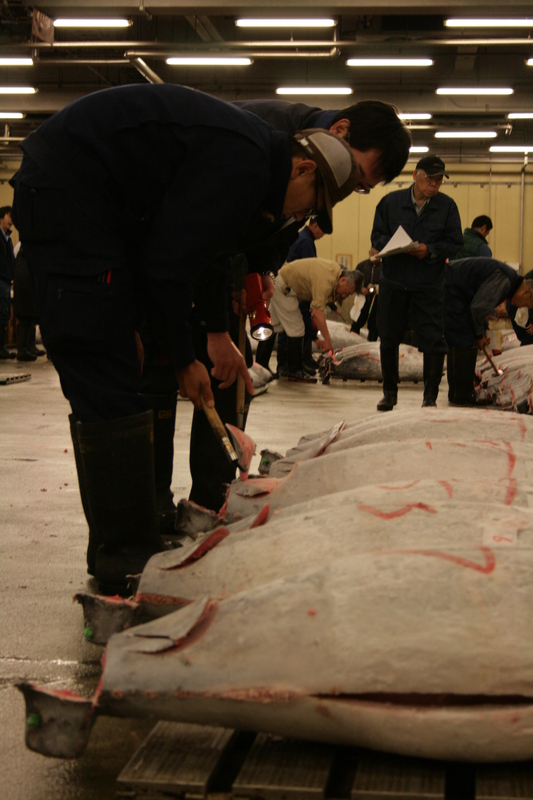 Each tuna had two inspection cuts; one at an angle down to the meat just under the skin, and the other right through the tail. 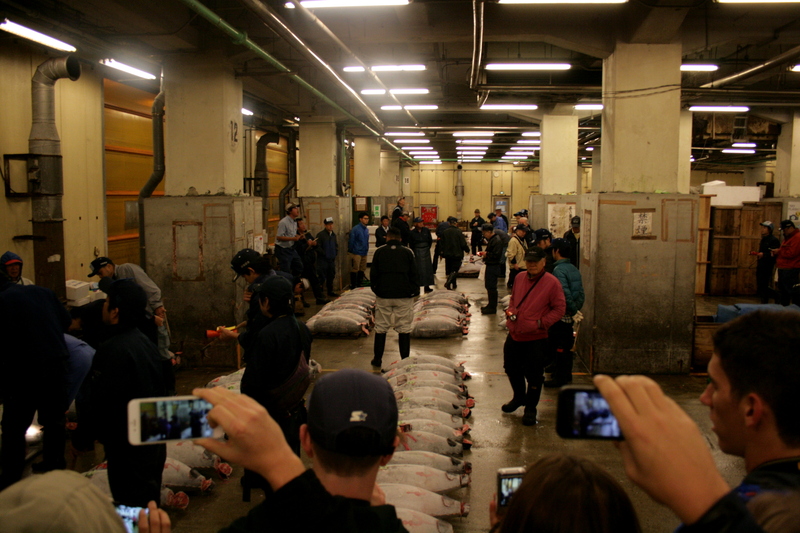 Buyers wandered around with fishbats and flashlights, inspecting each fish. Men with clipboards followed them around, taking notes. The whole operation was pretty quiet, apart from all of us tourists. 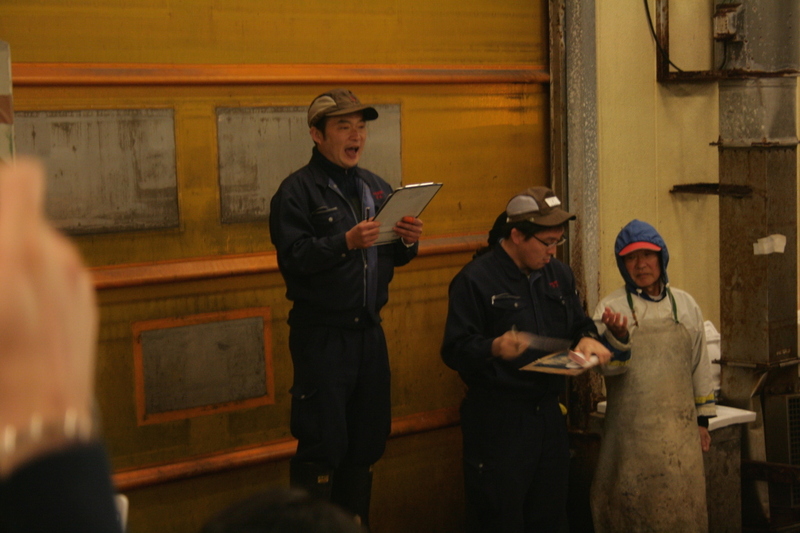 Around the time we collectively tired of taking pictures of the fish popsicles, a bell started ringing and the auction began. The buyers lined up on one side, and the sellers stood on the other, surrounding a man on a pedestal who shouted unintelligible things at a rapid-fire pace. Hand signals were made. Shouting got louder. Fish were moved. Over and over, each fish found a new home. I wish I could tell what he was saying. 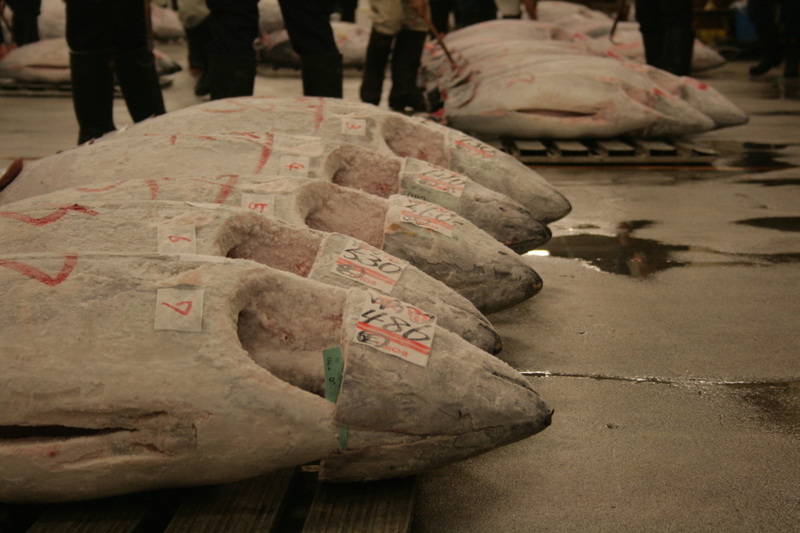 I have no idea what these tuna were selling for, but my guess is it was quite a lot. 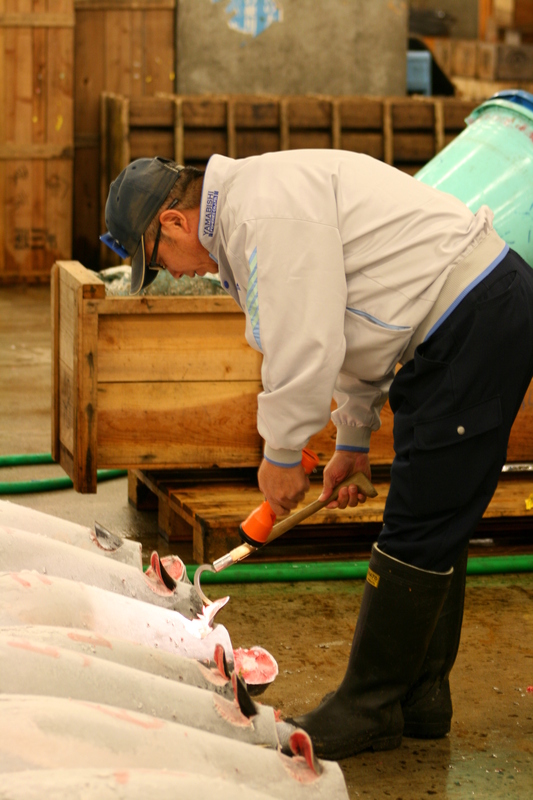 One Response to "Tsukiji Fish Market"